222 pages | 22 B/W Illus. This book documents the long, still ongoing battle between the US Food and Drug Administration and the dietary supplement industry. It presents the complex, often subtle, and sometimes overlooked series of events that had a major impact on how dietary supplements are manufactured, marketed, sold, and used today. 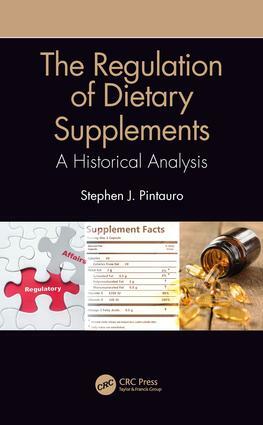 While the first few chapters focus on some background topics, the remaining chapters walk the reader through timeline of events, legislative actions, FDA proposed and final rules, and judicial decisions that led to our current dietary supplement regulatory framework. Interwoven in narrative are examples of the roles of science, social and public policy, politics, and popular media. Introduction. Dietary Supplement Use in the United States. Our Federal Food Regulatory Structure. The Early History of Dietary Supplement Regulation. Dietary Supplements: Foods or Drugs? Food Labeling vs Food Advertising. The Battle Over Health Claims. Congress Takes Action. The Congressional Hearings. DSHEA: Defining Dietary Supplements. DSHEA: A New Safety Standard for Dietary Supplements. DSHEA: Structure-Function Claims vs Health Claims. DSHEA: Other Important Provisions. The Health Claims Debate Continues. Where Do We Go From Here? Stephen J. Pintauro is Associate Professor in the Department of Nutrition and Food Sciences at the University of Vermont (Burlington, VT). Over my 36 years as a faculty member at UVM, he has taught many courses, including “Fundamentals of Food Science” class (sophomore/junior level), a junior/senior level “Advanced Nutrition” class, as well as a graduate level “Research Methods” course. In addition, since the early 1990’s he has been teaching a “Food Regulation” course. He was awarded the College of Agriculture and Life Sciences Carrigan Award (for excellence in undergraduate teaching) in 2000, and the Kroepsch- Maurice Award for Excellence in Teaching (UVM’s most prestigious teaching award) in 2015. He focuses a significant amount of his research and scholarship efforts on various topics related to “teaching technology and pedagogy.” The USDA’s Higher Education Challenge Grants Program funded two of his research projects over the years. Other teaching-related projects were funded through competitive UVM funding sources. He continues to experiment with teaching technologies and strategies.